Hubert Robert is one of the quiet voices of French painting. In his youth he worked and studied with Fragonard, a louder talent by comparison, as both artists mastered the subtleties of a shared rococo style. In 1761 they travelled together to southern Italy, the wellspring of Robert's essentially classicising project. Italian view-painters such as Panini and Piranesi authorised his attraction to ancient sites and antiquarian subjects, alerting him to the enduring possibilities of the fragmentary tradition. 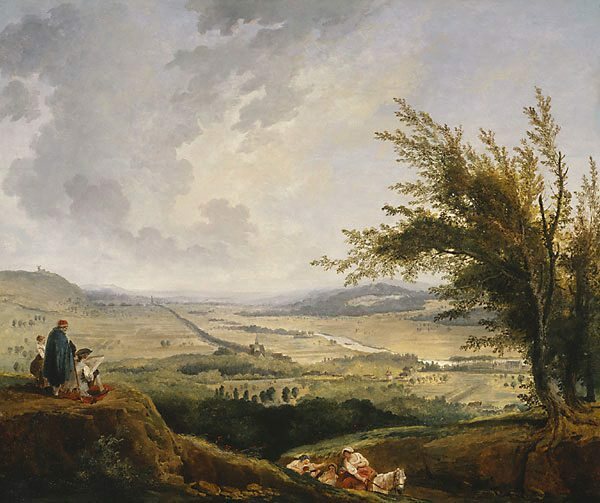 Even in his native France, Robert's landscapes are unmistakably classical in tenor. The Roman Campagna insinuates itself into this otherwise descriptive scene of the countryside near Paris. Though it lacks anything so imposing as architectural ruins or sculptural wreckage, one senses a powerful note of nostalgia in the work. Even so, few views by Robert are as uncomplicated or as fresh as this, the airiness of the scene prefiguring nineteenth-century innovations in French landscape painting. The artist shown at work on the left is conceivably Robert himself. Signed and dated l.r., oil "H. Robert/ 1781". James Oswald Fairfax AC, 25 Oct 1988-22 Jun 1995, Bowral/New South Wales/Australia, Gift of James Fairfax 1995. Purchased by James Fairfax from Colnaghi, New York, 25 October 1988. Bruce James, Art Gallery of New South Wales handbook , 'Western Collection: Paintings and Sculpture', pg. 17-77, Sydney, 1999, 32 (colour illus.). Art Gallery of New South Wales Annual Report 1995 , Sydney, 1995, 56.